Don’t let your Silhouette machine just sit in a box and collect dust! 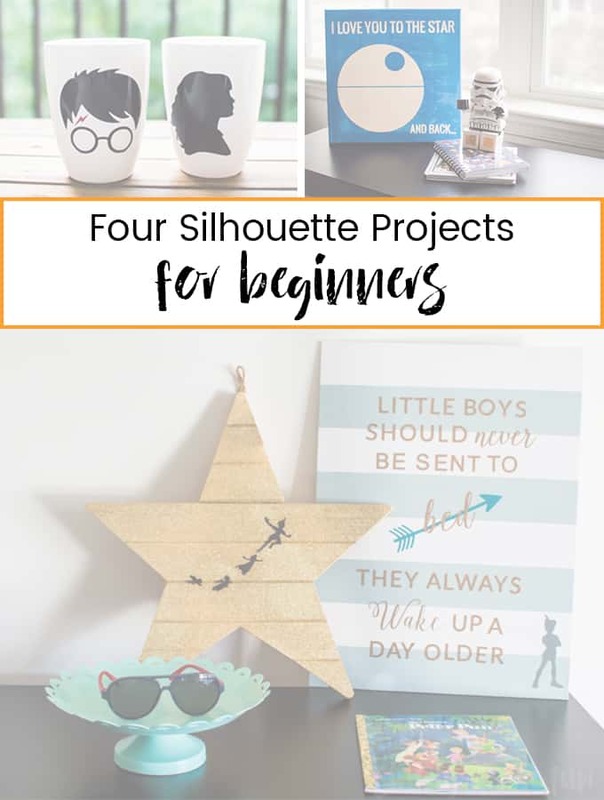 Pull it out and do these four Silhouette projects for beginners! I’ve only owned my Silhouette Portrait for eight months now and I can honestly say that it has changed my crafting life. It makes crafting so much easier and allows me to be so much more creative than I ever thought I could be. It took me a while to warm up to the machine but once I did I haven’t stopped using it! I never knew all the fun stuff I could do with it (and I’m sure I’ve only played around with less than a third of the possibilities) and now I’m telling every crafter I know they need this machine. It will change your life. Honest! Chris and I currently live in an apartment, and because of that I do not have a designated crafting space. My computer desk is incredibly small and there isn’t a whole lot of room for all of my crafting supplies. By buying the more compact machine I was able to save a bit of space and not crowd my desk too much! There is a significant price difference between the two machines, and since I was just starting to get serious about blogging at the time I didn’t want to spend a ton of money on a cutting machine. While the cameo offers a bigger cutting area (12×12) I did not feel that justified the $100 price difference between the two. I was content with the idea of cutting smaller designs and paying a little less. It’s worked out well for me! To be honest, the biggest difference between the two is that the portraits cut dimensions are 8×10 while the cameo is 12×12. While it is a bit annoying to constantly cut down large pieces of scrapbook paper to fit the 8×10 portrait mat, I really don’t mind it that much. If you’re a fan of doing bigger designs or are using the machine as part of your business then a cameo may be what works best for you. But, as a blogger who just uses it for fun, I’m really glad I went with the portrait! Did you know you can cut out a quote on vinyl and use it as a stencil? Yea, I didn’t either! I was pleasantly surprised when I realized I could do that and it made labeling items or adding fancy lettering and sayings to different things around the house. The first time I used it for that was on my coffee tray, and it made the entire project so much more fun! So I may be a little bit obsessed with Harry Potter, and I thought it would be so fun to cut out decals to put on coffee mugs for my husband and I! Let me tell you, they came out great! Using Oracle 651* (permanent vinyl) means that you can hand wash these babies and the vinyl won’t come off, I love it! I’ve seen people make window and car decals, magnets, and so many other things for themselves and others. And with the holiday’s coming up it might be a lot of fun to make some themed decals for your kiddos! Or you can make a cute hostess gift, like I did here! I made the mistake of using Silhouette brand vinyl (bad, bad idea!) on my first canvas art project but they still turned out great! Since then I’ve used Oracle 651 vinyl because it’s permanent and much easier to cut (seriously, so much easier!). My latest was this Buddy the Elf canvas and it came out perfectly! I’ve definitely learned a lot since my first wall art project (my nephew’s nursery prints!). Heat transfer vinyl has become my latest obsession, and I have made so many things with it! Mainly I’ve made baby onesies like these Harry Potter and Nerdy Baby ones, but you can pretty much HTV anything! I’ve seen people do backpacks, pencil cases, blankets, hats, and more. Seriously, the possibilities are endless! And you can also personalize anything you do which means anything you HTV would make an awesome gift! So, those are my four favorite things to do with my silhouette so far! Do you own a silhouette machine? What do you use yours for? Click on the picture below for tips and more project inspiration! Or, if you’re looking for more silhouette inspiration, check out my Pinterest board! Hi Shelley, if you click on the links within the posts it’ll take you to the tutorials for the projects. Thank you just bought the camo ecited but didn’t know what to learn on. You gave me some great ideas. Can you do the same projects with the cameo as you do with the one you have? I want it to make portraits of my grandkids for their parents…plus anything else it can do. Hi Cathy! I actually upgraded to the Cameo a few years ago and yes, you can do anything with the Cameo that you could do with the Portrait machine.